Liver Functions - What does the liver do? The liver is a master at multitasking. But many of us do not know even the basic liver functions. Let's take a look at what the liver does for us. The liver is our largest internal organ - about the size of an American football! And weighing in at around 3-3.5 pounds (about 1.5 kg). And when the liver is working properly, it keeps many of our body's systems in balance. 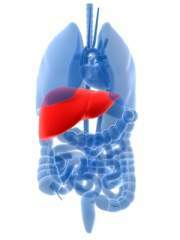 The liver is a vital organ and we cannot survive without it. Liver dysfunction is an all too common condition resulting in poor health and a weakened immune system.